A more comfortable and reliable blood-sugar monitoring system is being designed at KTH Royal Institute of Technology (KTHRInstTech) in Stockholm for people with diabetes (lat. Diabetes Mellitus). After successfully testing a prototype of a microneedle patch on a human subject, the completion of a system for clinical tests is now underway. Continuous monitoring is a way to safely and reliably lower blood glucose – giving the user a full picture of their glucose levels throughout the day and helping them avoid severe hypoglycemia. 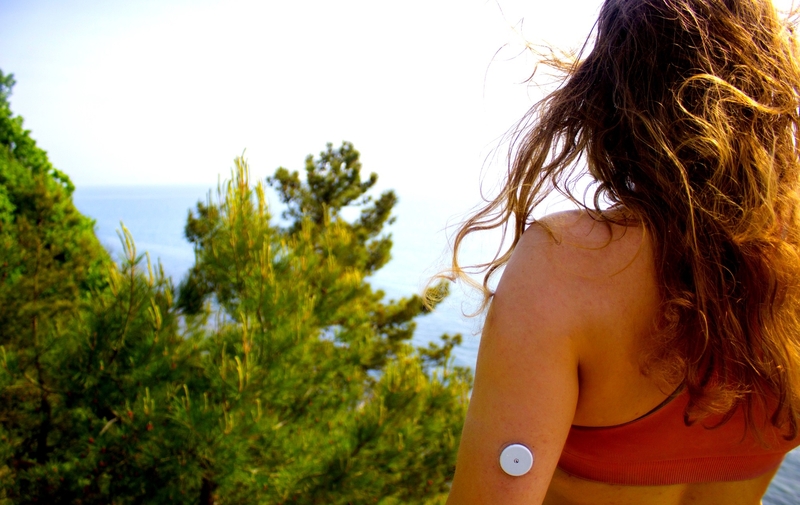 But the continuous glucose monitoring systems (known as CGMS) in use today have two main drawbacks: they are uncomfortable since they require a minimum 7mm needle that’s inserted into the skin; and, because of their size, they take measurements in the fat tissue – not the most ideal location. Currently, researchers have developed a promising alternative: a microneedle patch that is 50 times smaller than the needles used in today’s CGM systems. The combination of the patch and an extremely miniaturized three-electrode enzymatic sensor was shown in a recent study to be capable of correctly and dynamically tracking blood glucose levels over time, with a delay of about 10 minutes, when applied to a human subject’s forearm. One of the researchers in the Division of Micro and Nanosystems, doctoral student Federico Ribet, says the next steps are to develop a transferable adhesive patch, along with algorithms and embedded electronics for a fully-realized system to take to clinical trial. 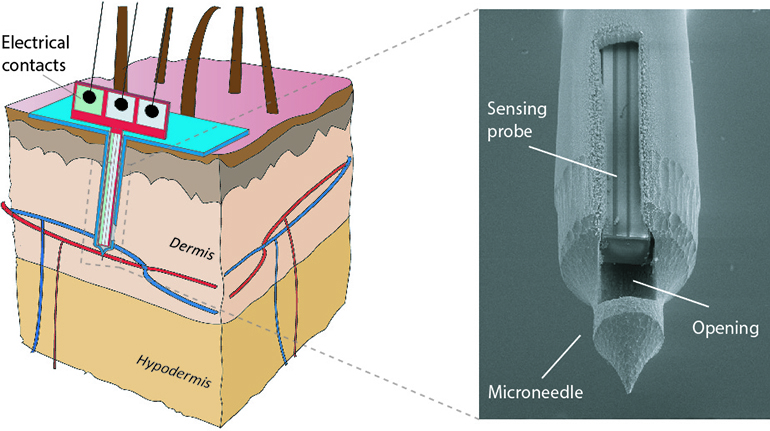 Within the dermis, the hollow microneedles rely on natural capillary action to fill up with interstitial fluid, the liquid surrounding the cells in the skin. Nutrients like sugar, diffuse out of the blood capillaries in this fluid to reach the cells. An important distinction is that unlike commercially available CGMS which measure the subcutaneous fat tissue, the measures within the skin less than 1mm deep, where the interstitial fluid follows closer and more homogeneously the blood-glucose oscillations. 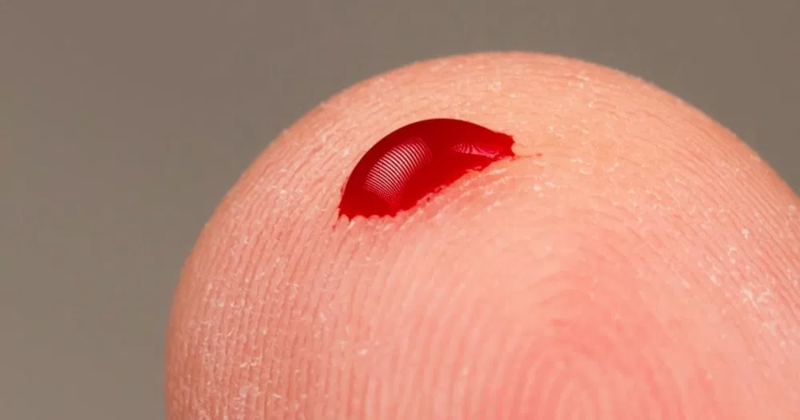 This would offer an alternative to pricking one’s fingers several times a day to take a blood test, although a user would still occasionally have to do so – as they do with commercial CGMS – in order to recalibrate the sensor and get the most accurate and immediate readings. But with this new system, that could one day change. Federico Ribet points out that the most advanced CGM device now on the market is factory calibrated and reduces the frequency of having to conduct a finger blood test. The scientist says the research team at KTH – which includes Associate Professor Niclas Roxhed and Professor Göran Stemme – believes it could ultimately match, or even surpass this level of quality.